Jeff Bezos accepts the Gerard K. O’Neill award from Space Studies Institute co-founder Tasha O’Neill at the National Space Society ISDC in Los Angeles. 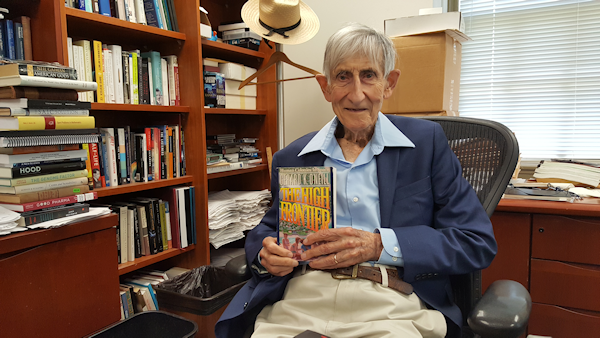 From our personal talks before the ceremony and from his heartfelt words to the attendees at the event, we want our SSI Associates to know: He truly “gets” The High Frontier Concept. 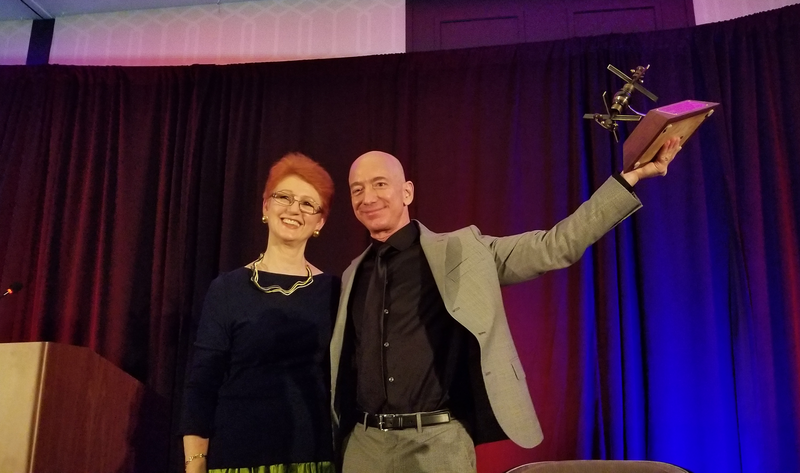 Space Studies Institute co-founder and Senior Associate Tasha O’Neill sent us this link to Alan Boyle’s Geekwire chat with Jeff Bezos which took place just after he accepted the Gerard K. O’Neill award last Friday night at the NSS ISDC in Los Angeles. Here is a link to that on the SSI Announcements page on Facebook: https://www.facebook.com/SpaceStudiesInstitute/posts/971465493023029 . Remember, even if if you don’t have and don’t want a Facebook account, you can visit the SSI Facebook page to see the latest fast bits of information. Just use the url: https://www.facebook.com/SpaceStudiesInstitute and move the popup that asked you to log in, all of the posts are viewable without having to sign up for anything at all. SSI Senior Associate Dr. Heidi Fearn and Senior Advisor Jeff Greason join the Progress in Novel Space Propulsion panel at Breakthrough Discuss 2018. Breakthrough Discuss was an invitation-only conference held April 12th and 13th at Stanford University featuring a who’s-who of advanced Space biology and physics topics. The conferences was co-hosted by Stanford University’s Department of Physics, Harvard-Smithsonian Center for Astrophysics, NASA Astrobiology Institue and NASA Ames Research Center. The complete video is uncut and includes long stretches of blank space, such as for the lunch break, but you can scroll through it and the video link we placed below should begin at the start of the Progress in Novel Space Propulsion session (6 hours 17 minutes into the 7 and a half hour video). Will you be at the ISDC? Jeff Bezos, Founder of Blue Origin and Founder and CEO of Amazon.com will receive the Gerard K. O’Neill Award for Space Settlement and Professor Freeman Dyson, a dear man with credits to Science and Humanity – and SSI – far too numerous to name, will be receiving the Heinlein Award. A very exciting fact that isn’t yet on the NSS pages is that Space Studies Institute Co-Founder Tasha O’Neill will be doing the presentations to Mr. Bezos and Professor Dyson. Everyone involved in Space knows that the NSS knows how to put on a show and the ISDC is always THE place to meet old friends and make new Space relationships. We encourage you to look at your calendar and set aside May 24th-27th 2018 for this year’s once in a lifetime event. 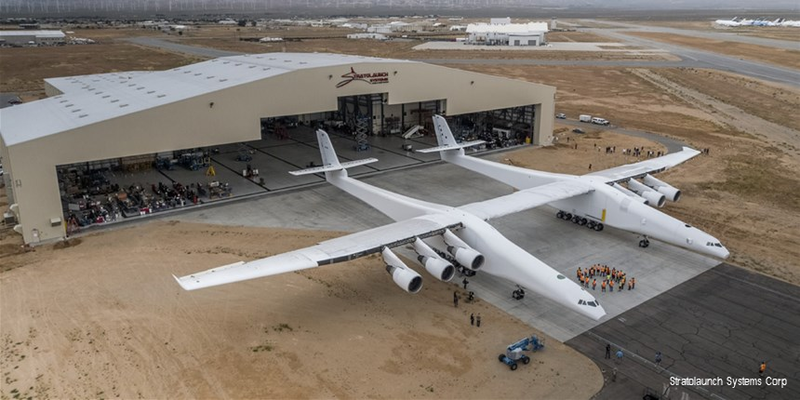 Did you see this NBC item on Stratolaunch? SSI President Gary C Hudson talks of a fellow Mojave Spaceport group.